Devotional: Are You Limiting God? By Jason Mitchener 6 Comments - The content of this website often contains affiliate links and I may be compensated if you buy through those links (at no cost to you!). Learn more about how we make money. Last edited April 24, 2017 . Israel was losing the war against the Syrians. God’s prophet Elisha was dying. All seemed bleak. King Joash visits the dying Elisha. Joash begins to weep. He knows Elisha’s death will prove a great loss to Israel. “Get a bow and some arrows,” Elisha tells Joash. “Put your hand on the bow,” Elisha says. The king does this and then feels the prophet’s own wrinkled hands wrapped around his. “Open the window eastward.” Joash does. “The arrow of the Lord’s deliverance.” Elijah tells him. 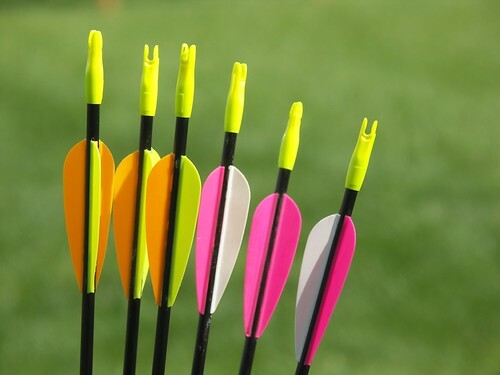 The arrows represented the Lord’s deliverance in Israel’s battle against Syria. “Take your arrows and smite upon the ground,” Elisha tells the king. The king smites the ground three times. Elisha becomes angry. “You should have struck the ground five or six times; then you would have defeated Aram and completely destroyed it. But now you will defeat it only three times.” (2 Kings 13:19). Do you limit God’s blessings like Joash did? Do you smite the ground a measly three times when a whole quiver full of arrows is available to you? God has made us joint heirs with Christ. He offers us innumerable blessings and promises. Yet we are content to live on crumbs when a banquet table full of spiritual delicacies is spread for us. We wallow in despair when God offers us joy. We live in anxiety when prayer can bring us peace. We feel lonely even though God is always with us. We tremble in fear when faith could help us stand. We struggle to endure when Christ offers the gift of longsuffering. God’s promises are exceedingly great and precious. Grab them. Claim them for your life. Don’t limit God. The Lord of the impossible is waiting for you to call on His name. Will you call on Him now? Thanks Jason. It is a blessing to know you. This particular one hits close to home for me this week. God Bless You. I’m doing my best to not limit God or put Him in a box every day! I’m trying hard to listen quietly and learn, it is a journey though. Great post my friend! It can be hard not to limit God. Sometimes I simply ask Him to bless me with what He thinks I need, rather than asking for things that may not necessarily benefit me in the long run. God knows my needs better than I do — even if I don’t understand the “why” behind it all. Mirandas last blog post..Is Your Attitude Toward Money Controlling Your Financial Future? If you keep praying to God and trying hard on becoming a better Christian each day, then you will not limit God, since God offers us blessings, peace, happiness and protection from all the evil. Next Post: $1000 To Start A Small Emergency Fund: Is It Enough?